Extracorporeal photochemotherapy (ECP) is considered as an immune modulating therapy majorly targeting the T cells of the Immune system. ECP induces an anti-inflammatory condition with tolerogenic responses without inducing a global immunosuppression state which is a typical feature of other therapeutic options such as steroids. Clinical indication of ECP has grown over time since its initial applications. Our review discusses the technical aspects of the concept of photopheresis with the available methods for its clinical applications. Background: Team-based learning (TBL) combines small and large group learning by incorporating multiple small groups in a large group setting. It is a teacher-directed method that encourages student–student interaction. This study compares student learning and teaching satisfaction between conventional lecture and TBL in the subject of pathology. Aims: The present study is aimed to assess the effectiveness of TBL method of teaching over the conventional lecture. SETTINGS AND DESIGN: The present study was conducted in the Department of Pathology, GMERS Medical College and General Hospital, Gotri, Vadodara, Gujarat. The study population comprised 126 students of second-year MBBS, in their third semester of the academic year 2015–2016. Methodology: “Hemodynamic disorders” were taught by conventional method and “transfusion medicine” by TBL method. Effectiveness of both the methods was assessed. 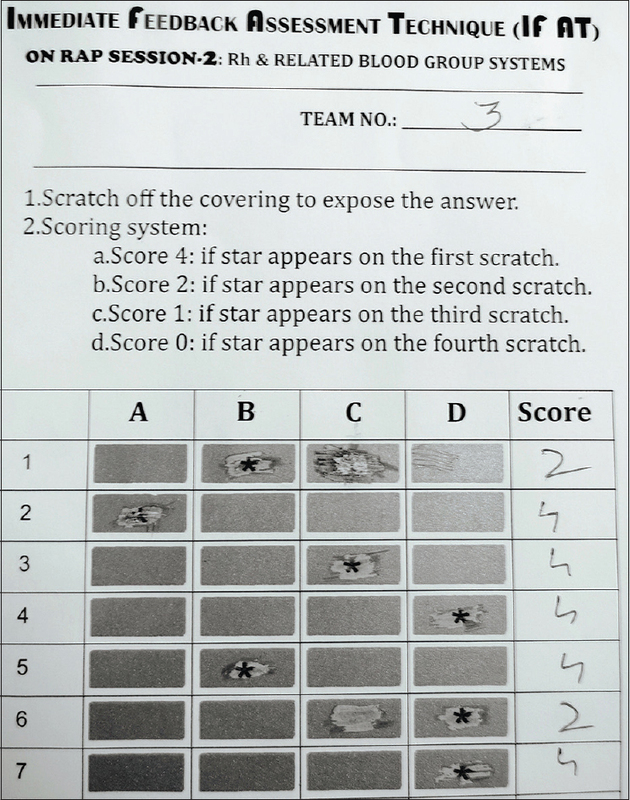 A posttest multiple choice question was conducted at the end of “hemodynamic disorders.” Assessment of TBL was based on individual score, team score, and each member's contribution to the success of the team. The individual score and overall score were compared with the posttest score on “hemodynamic disorders.” A feedback was taken from the students regarding their experience with TBL. Statistical Analysis Used: Tukey's multiple comparisons test and ANOVA summary were used to find the significance of scores between didactic and TBL methods. Student feedback was taken using “Student Satisfaction Scale” based on Likert scoring method. Results and Conclusions: The mean of student scores by didactic, Individual Readiness Assurance Test (score “A”), and overall (score “D”) was 49.8% (standard deviation [SD]-14.8), 65.6% (SD-10.9), and 65.6% (SD-13.8), respectively. The study showed positive educational outcome in terms of knowledge acquisition, participation and engagement, and team performance with TBL. Context: Coronary artery bypass graft (CABG) operation is associated with high frequency of allogeneic blood transfusion due to the acquired hemostatic challenges in patients undergoing CABG. However, allogeneic blood transfusion carries risks of infection, adverse reaction, and mortality as well as prolonged hospital stay and increased hospital cost. It is important to identify patients who require blood transfusion to mitigate their risk factors and reduce the chance of exposure to allogeneic blood. Aims: This study was conducted to evaluate factors that influence the decision to transfuse red cell in first-time elective CABG patients. Settings and Design: This was a cross-sectional study based on a retrospective record review. The study was done in the National Heart Institute. Materials and Methods: All patients who underwent first-time elective CABG were included in this study. Variables analyzed include age, gender, body weight, preoperative hemoglobin (Hb) level, patients' comorbidities, and other clinical parameters. Statistical Analysis Used: Data were analyzed using SPSS software version 20. Results: A total of 463 patients underwent first-time elective CABG during the period of the study. Three hundred and eighty-six (83.4%) patients received red cell transfusion. From multiple logistic regression analysis, only age (odds ratio [OR] = 1.040, 95% confidence interval [CI]: 1.003, 1.077, P = 0.032), body weight (OR = 0.951, 95% CI: 0.928, 0.974, P < 0.001), Hb level (OR = 0.500, 95% CI: 0.387, 0.644, P < 0.001), and cardiopulmonary bypass time (OR = 1.013, 95% CI: 1.004, 1.023, P < 0.001) were the significant independent predictors of red cell transfusion. Conclusions: By stratifying patients according to their risk factor for red cell transfusion, the high-risk patients could be recognized and should be enrolled into effective patient blood management program to minimize their risk of exposure to allogeneic blood transfusion. Background: Neuromyelitis optica (NMO) is an autoimmune demyelinating disease preferentially targeting the optic nerves and spinal cord. Plasmapheresis (PP) is an effective adjunct therapy in severe NMO attacks. The recommended minimum plasma volume to be treated per session of PP is equivalent to total plasma volume (TPV) of the patient. Aim: To study the effect of lower plasma volume treated in patients with NMO on clinical efficacy of plasmapheresis in comparison to minimum recommended volume. Methods: This retrospective study was done on acute NMO patients who were managed with PP at our center. Patients who had 5 sessions of PP, spread over 10 days, were included. Clinical outcome was defined as per predefined criteria. Results: 24 patients who underwent PP for acute NMO met our inclusion criteria. Females (age; mean (SD) 33.7 (11.2) years) were more common (n = 18). The minimum recommended plasma volume (PV) that was supposed to be treated per patient during entire acute therapeutic period was 195.5 (14.6) mL per kilogram-body-weight (kg-bw). We treated lower plasma volume (mean (SD) 112.7 (17.0) mL per kg-bw); the difference was significant (P < 0.05). The volume treated was same across the gender (P > 0.05). Significant clinical improvement was observed in 79% of patients (n = 19) after 6 months. There were no significant differences in volume of plasma treated, between patients who had moderate and marked improvement; also, who did, and did not have significant clinical improvement (P > 0.05; for both). Conclusions: Plasmapheresis is a safe and efficient add-on therapy in NMO, especially in steroid-resistant cases. Although the volumes of plasma treated during acute plasmapheresis were less than recommended minimum volumes, majority of patients had significant clinical improvement. Background/Hypothesis: Creeping monotony in the treatment provides minimal motivation for children with beta-thalassemia major, leading to noncompliance for adequate blood transfusions and iron chelation therapy. This study was envisaged to formulate a clinical compliance score and correlate the score with their linear growth velocity and weight gain. Materials and Methods: A prospective longitudinal study among 30 thalassemia children aged between 1 and 18 years was conducted in the Department of Pediatrics, Tata Main Hospital (TMH), Jamshedpur, from July 2012 to January 2014. Relevant clinical information and investigations were recorded using a predesigned pro forma. Compliance score was calculated using pre-, post-transfusion hemoglobin and serum ferritin levels. The height velocity and weight gain were calculated. The same patients were re-assessed in January 2015. Results and Discussion: Mean age of children was 10.18 ± 4.98 years. Forty percent were females. Using the scoring table, 33% were in good category of compliance while 4% had poor compliance. The mean height velocity was significantly higher in good compliance category as compared to average or poor score category in 2014 (P = 0.017). Good compliance score children continued to maintain higher height velocity during the 1-year follow-up (P = 0.02). Average weight gain was higher in good compliance category. Conclusion: This paper brings out a simple, regularly monitored scoring system to promote growth in thalassemia children through improved compliance to treatment, which incentivized them to maintain or improve their scores for better height velocity and weight gain. No such compliance score has been tabulated for thalassemia patients as of date. Introduction: Repeated blood transfusions can result in the production of alloantibodies against one or more red cell antigens, which complicates subsequent transfusions. 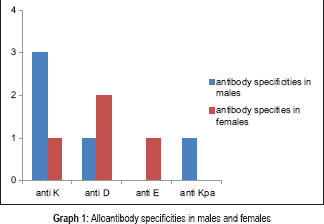 Aims: The study was done to find incidence of various red cell alloantibodies; to determine the type of alloantibody; to identify the factors such as frequency of transfusion, splenectomy status, donor ethnicity and gender and their association with the development of antibody in repeatedly transfused patients. Materials and Methods: This study was carried out in Dept. of IHBT, Shree M. P. Shah Medical College, Jamnagar, Gujarat. Blood was taken from the patients of thalassemia major, sickle cell disease, chronic renal failure, post partum haemorrhage, aplastic anemia, Myelodysplastic syndrome with more than 10 red cell transfusions. The plasma/serum was used for antibody screening and antibody identification test. Three cell antibody screening was performed using antihuman globulin gel cards (ID-Card LISS/Coombs) and three cell panel (ID-DiaCell I,II,III-Asia). Those with positive antibody screening were analyzed further for antibody identification test using eleven cell panel (Set ID-Dia Panel). Results: Antibody screening and identification was done in 2 consecutive set of samples (n = 300) which showed, nine (9) patients (3%) were alloimmunized. All repeatedly transfused patients had developed alloantibody before the starting of study period, no patient developed new alloantibody during study period. Conclusions: Alloantibodies should be identified in repeatedly transfused patients and should be given corresponding antigen negative blood unit which will minimize the antibody mediated destruction of transfused red cells. Background: The INDIAN blood group system comprises 4 antigens sensitive to enzymes and 2-aminoethyl isothiouronium bromide (AET). AIM: The patient's antibody was investigated for its specificity to the high-frequency antigens (HFA) of this system. Material and Methods: Low ionic strength solution (LISS)-tube/LISS-indirect antiglobulin test (IAT) methods were used. The patient's red blood cells (RBCs) were tested with antisera to HFA. Her antibody was tested with RBCs lacking the HFA. Furthermore, it was tested with RBCs as untreated or treated with enzyme or AET. The genetic sequence was studied for mutation in CD44 gene that encodes INDIAN antigens. Results: The patient was grouped A1B, RhD+, antibody screening test positive, direct antiglobulin test negative. A negative autocontrol test had suggested to the alloantibody being present. Antibody had agglutinated RBCs in LISS-tube at RT and by LISS-IAT at 37°C. The RBCs of the 11-cell panel, those lacking HFA and from 50 random donors, were agglutinated by her antibody indicating its specificity to the HFA, though the RBCs of Lu (a-b-)/In (Lu) type showed a weaker reaction. The patient's RBCs were agglutinated by antisera to a number of the enzyme-sensitive HFA, including those of INDIAN blood groups. The antibody showed reduced reactivity with the RBCs treated with papain, chymotrypsin, and AET but resistant to trypsin and dithiothreitol. The patient's genetic sequence revealed a novel homozygous mutation 449G>A in exon 5 of CD44. 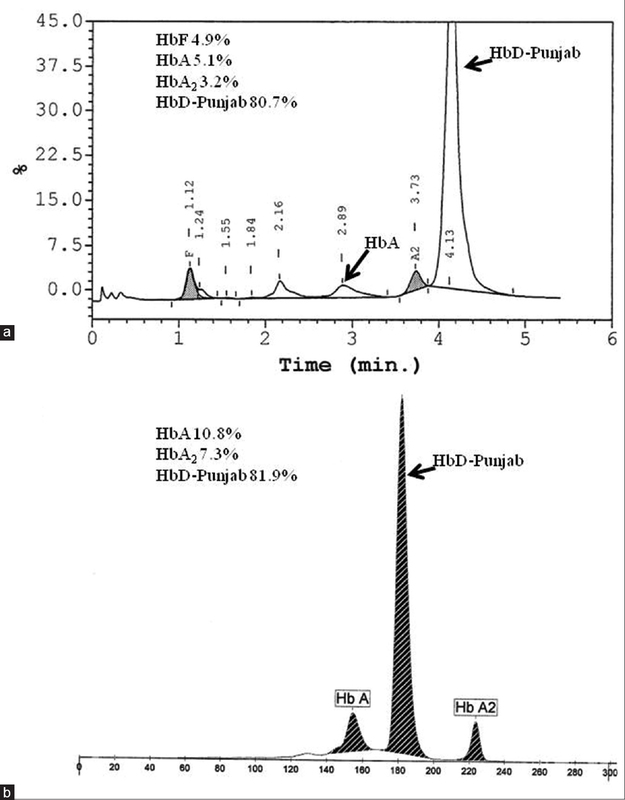 Conclusion: The antibody to enzyme sensitive HFA was tested for serological and molecular genetics studies and found to be directed to the novel HFA, named as INRA of the INDIAN blood group system and was assigned a numerical symbol IN: 005 by the International Society of Blood Transfusion (ISBT). Background: Many strategies have been explored to reduce multiple donor exposures in neonates such as use of restrictive transfusion protocols, limiting iatrogenic blood loss, use of recombinant erythropoietin and single donor programs. Method: In our study we assessed the feasibility of dedicating single donor units with reserving all the components from the same donor for the specified neonates/ infants undergoing surgery and estimating reduction of donor exposure. Fifty neonates undergoing surgery were included in the prospective study group and the transfusion details were compared with 50 retrospective cases with same inclusion criteria. Results: An intra-operative blood loss of >13 ml/Kg was significantly associated with transfusion (P<0.05) which was most frequently administered in the intra-operative period. 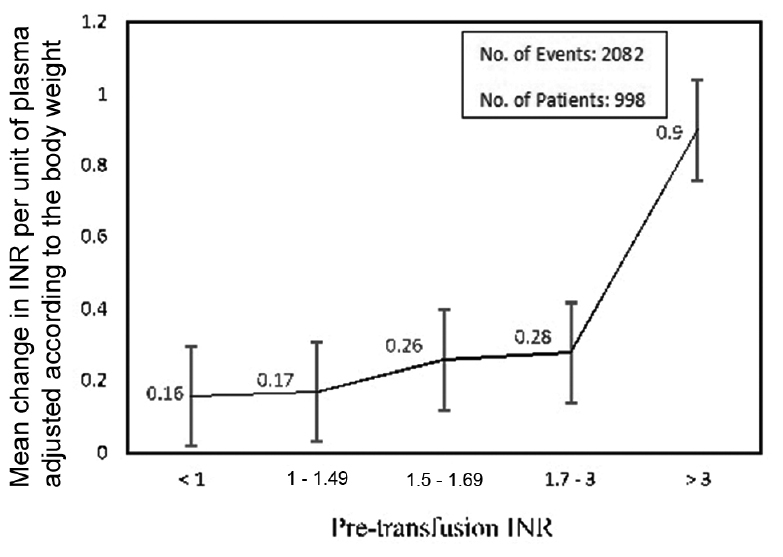 Donor exposure rate of overall transfusion was 1.15 in the study group as compared to 4.03 in the retrospective control group. 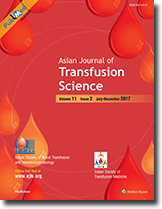 In study group Donor Exposure Rate (DER): Transfusion Rate (TR) ratio was 1:1.5 and Transfusion per Donor Unit (TPDU) of 1.5, means that one donor unit contributed to 1.5 transfusions in each patient and contributed to 50% reduction in donor exposure in each patient as compared to retrospective control group. Conclusion: Our study showed that by practicing dedicated donor unit transfusion policy, for neonates undergoing surgery we could significantly reduce the donor exposure. Introduction: Measurement of alloantibody titer to a red cell antigen (ABO titers) is an integral part of management of ABO incompatible kidney transplants (ABOiKT). Material and Methods: There are different methods of titer estimation. Alloantibody detection by tube titration and Gel agglutination columns are accepted methodologies. It is essential to find the difference in titers between the two methods so as to set the 'cut-off' titer accordingly, depending upon the method used. Results: We did a prospective observational study to compare and correlate the ABO titers using these two different techniques – conventional tube technique (CTT) and the newer column agglutination technique (CAT). A total of 67 samples were processed in parallel for anti-A/B antibodies by both tube dilution and column agglutination methods. The mean titer by conventional tube method was 38.5 + 96.6 and by the column agglutination test was 96.4 + 225. The samples correlated well with Spearman rho correlation coefficient of 0.94 (P = 0.01). Conclusion: The column agglutination method for anti A/B titer estimation in an ABO incompatible kidney transplant is more sensitive, with the column agglutination results being approximately two and half fold higher (one more dilution) than that of tube method. 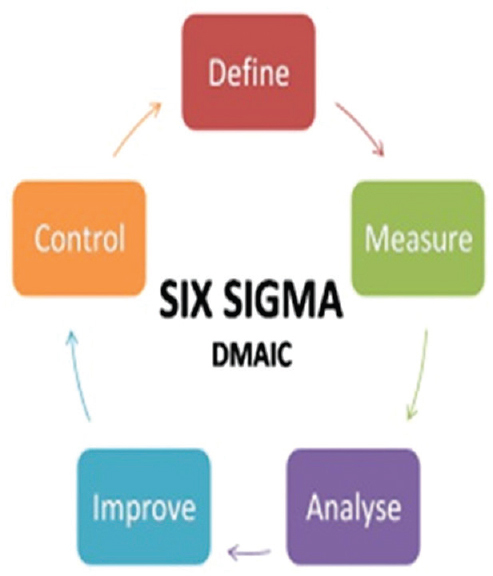 Background: Process Excellence is a value based approach and focuses on standardizing work processes by eliminating the non-value added processes, identify process improving methodologies and maximize capacity and expertise of the staff. Aim and Objectives: To Evaluate the utility of Process Excellence Tools in improving Donor Flow Management in a Tertiary care Hospital by studying the current state of donor movement within the blood bank and providing recommendations for eliminating the wait times and to improve the process and workflow. Materials and Methods: The work was done in two phases; The First Phase comprised of on-site observations with the help of an expert trained in Process Excellence Methodology who observed and documented various aspects of donor flow, donor turn around time, total staff details and operator process flow. The Second Phase comprised of constitution of a Team to analyse the data collected. The analyzed data along with the recommendations were presented before an expert hospital committee and the management. Results: Our analysis put forward our strengths and identified potential problems. Donor wait time was reduced by 50% after lean due to better donor management with reorganization of the infrastructure of the donor area. Receptionist tracking showed that 62% of the total time the staff wastes in walking and 22% in other non-value added activities. Defining Duties for each staff reduced the time spent by them in non-value added activities. Implementation of the token system, generation of unique identification code for donors and bar code labeling of the tubes and bags are among the other recommendations. Conclusion: Process Excellence is not a programme; it's a culture that transforms an organization and improves its Quality and Efficiency through new attitudes, elimination of wastes and reduction in costs. 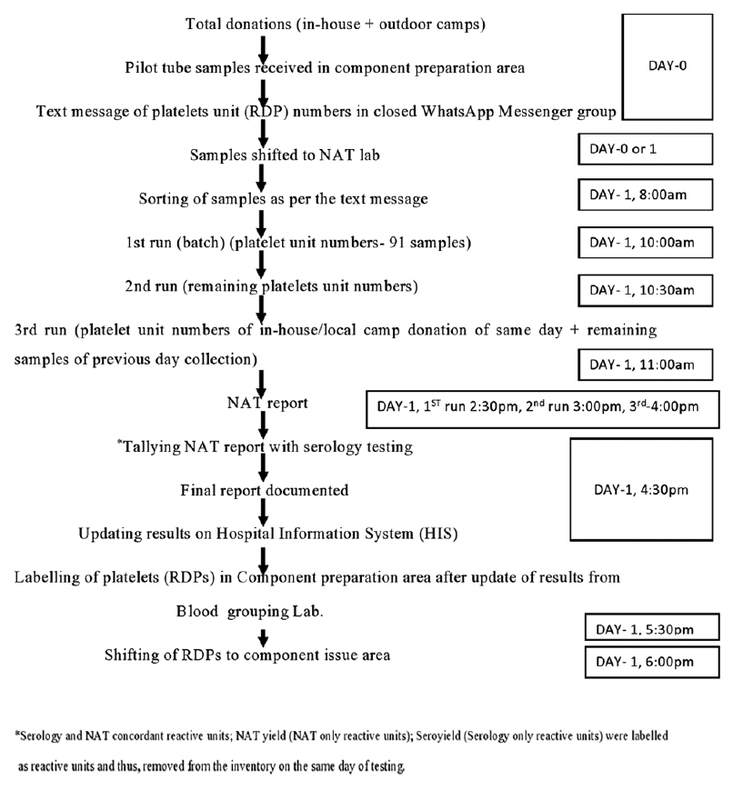 Background: Blood centers in India have published individual donor nucleic acid testing (ID-NAT) data based on an algorithm (Algorithm A) where serologically negative, NAT reactive sample was subsequently tested with discriminatory NAT (d-NAT), and on the basis of d-NAT, initial reactive samples were classified as “NAT yield” or inconclusive. We followed Algorithm B based on replicate testing and Ultrio Plus assay and compared the results with Algorithm A with Ultrio assay. Materials and Methods: Results of ID-NAT using two algorithms were analyzed. Results: A total of 88,583 (31,844 with Algorithm A and 56,739 with Algorithm B) samples were tested. Among serology nonreactive donations, NAT inconclusive results came down from 95.2% in Algorithm A to 73.1% in Algorithm B (P = 0.0001). Discriminated yield (DY) rate went up from 4.7% in Algorithm A to 21.9% in Algorithm B (P = 0.001). Conclusion: The study data suggest that replicate testing strategy and Ultrio Plus reduce the number of “inconclusive results” seen with earlier commonly used algorithm. We recommend a replicate testing strategy in ID-NAT testing since it will increase the DY and will eliminate the unnecessary discriminatory tests. 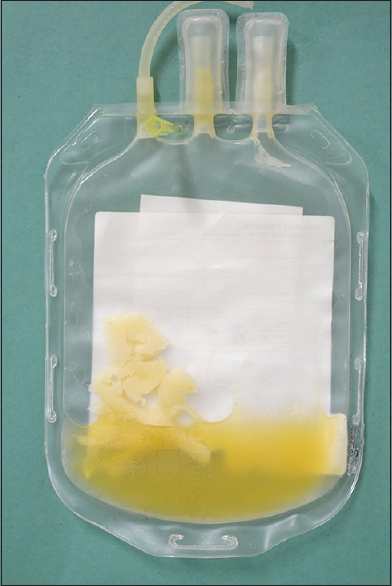 Background: Fresh frozen plasma (FFP) should be thawed before transfusing to the patient. Prolonged or uncontrolled thawing can denature plasma proteins. The potential risk of contamination by wet thawing had always been a point of concern. Aims: Here, we compared and evaluated the effect of thawing on clotting factor activities by two different methods (wet and dry) and other factors such as risk of bacterial contamination, throughput, turnaround time, and efficacy of thawing. Subjects and Methods: All FFPs were prepared from Group O donors and stored at −40°C. Twenty-one FFPs were thawed in Plasmatherm II at 45°C for 15 min and another 21 were thawed in thawing bath at 37°C for 20–30 min randomly. Analysis of prothrombin time, activated partial thromboplastin time, fibrinogen, and factor VIII was done in ACL TOP 300 (IL) at the time of preparation and immediately after thawing of FFPs. Volume, duration of thawing, ease of use, accessibility, and equipment maintenance were also compared. Results: There was a statistically significant difference in coagulation parameters after thawing in both methods compared to the time of preparation (P < 0.05), but all values were within normal limits. There was no significant difference in coagulation parameters between the two methods (P > 0.05). Mixed bacterial growth was observed from swabs taken from the water bath. Conclusion: Plasmatherm II can be a good alternative to water bath to rapidly thaw FFPs by preserving coagulation factors and eliminating the risk of bacterial contamination. Background: Donor deferral owing to anemia is one of the major causative factors of temporary donor rejection, which is preventable and treatable. The basic knowledge about frequency, types, and severity of anemia among donors will help plan a strategy to promote donor recruitment and overall national health. Objective: The objective of this study was to provide the predonation deferral rate of the healthy blood donors based on peripheral blood counts and second to determine the types of anemia along with its severity. Materials and Methods: Prospective records of all the reported donors were collected from January 2014 to December 2015 at Liaquat National Hospital, Karachi, Pakistan. Donor samples were analyzed on an automated hematology analyzer. Results: Overall, 36,954 potential donors reported to the blood bank, out of which 33,853 were selected and 3101 were deferred, which makes the deferral rate of 8.39%. Majority of donors (n = 2663 [7.20%]) were deferred based on peripheral blood counts. Based on peripheral count, anemia (91.8%) represents the major cause of deferral, followed by raised total leukocyte count (3.7%) and polycythemia (3.3%), and thrombocytopenia (1.0%) was the least potential cause. Microcytic-hypochromic anemia was found in 58.5% of the donors followed by normocytic and macrocytic anemia in 38.9% and 2.4%, respectively. Mild anemia was seen in 78.2% followed by moderate and severe anemia in 20.5% and 1.18%, respectively. Conclusion: A high prevalence of anemia among blood donors signifies deteriorating health status not only in donor population but also in general population. This situation calls for more concerted efforts as otherwise it would lead to decreased blood donor pool. Introduction: Hyperleukocytosis (HL) and leukostasis seen in myeloid leukemias are a medical emergency. We present a case series of ten such patients in a 4-year period. Sixteen therapeutic leukocyte reduction (TLR) were done in ten cases along with other supportive measures. The American Society for Apheresis supports the routine implementation of TLR in cases of HL secondary to myeloid leukemias with signs of leukostasis. Materials and Methods: The procedures were performed on the intermittent flow cell separator after discussion with the treating physician about patient's condition. Clinical, demographic, analytical, and technical variables were reviewed retrospectively and the patients were followed up at the end of 4 years. Descriptive analysis was performed for all variables, and relationships between quantitative variables and categorical variables were determined by applying the Student's t-test. Results: The mean age of presentation was 34 years. Priapism was the most common symptom followed by respiratory distress and neurological disturbances. After an average of 1.6 TLR procedures, the mean leukocyte count reduction achieved was 39.9% along with symptomatic relief. The mean survival at 4-year follow-up was 12.8 months and the overall mortality was 20%. Acute myeloid leukemia patients presented with lower mean platelet counts compared to chronic myeloid leukemia patients; however, the platelet loss in the final product was minimized. Conclusion: TLR is a safe and effective therapy for leukoreduction in hematological malignancies in our experience. Background: Allogeneic blood for transfusion is in short supply in most parts of the developing world. Cord blood for transfusion can be a significant source of blood supply to our health institutions. Aims: This study aims to investigate the knowledge and attitude to the donation and use of umbilical cord blood (UCB) for transfusion among the patients receiving services in a tertiary health institution in South-East Nigeria. Materials and Methods: This was a cross-sectional study; an anonymous structured questionnaire was used. A total of 549 consenting patients randomly selected from the antenatal, postnatal, sickle cell clinics, and wards were the subjects. Statistical analysis of the data was done using SPSS version 20.0. 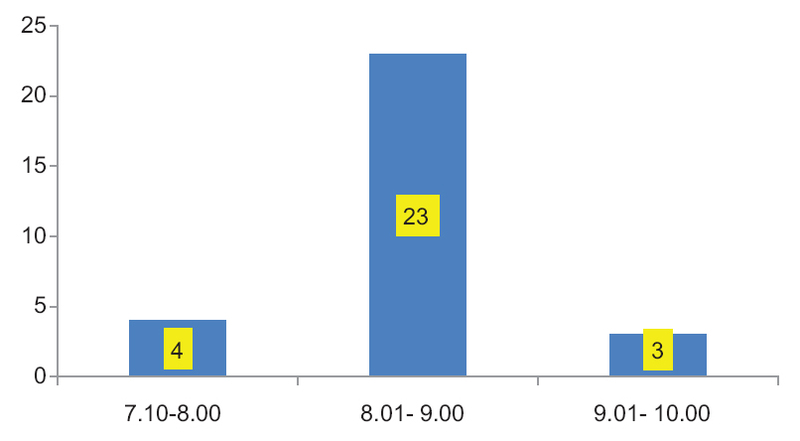 Results: The mean age of the participants was 31.9 ± 9.5 years. The majority were females (77.2%), married (86.4%). About 26.2% of the respondents were willing to accept UCB for transfusion to them or their child. Following counseling, the acceptance rate increased to 71.5%. Most of the respondents (80.0%) were willing to donate the UCB of their baby; or be tested for HIV (93.3%), if necessary. Educational level was significantly associated with knowledge of UCB. After logistic regression, occupation, and gender were significantly associated with acceptance of UCB for transfusion. Up to 52% belonged to low income family background, approximately 150 US dollars monthly family income (50,000 naira). Conclusion: The knowledge and acceptance of UCB for transfusion are low in our environment. However, proper counseling and public enlightenment could change this attitude. Background and Objectives: Various methods have been reported for the detection of antibodies in recipient sera, which can be human leukocyte antigens (HLAs) or non-HLA specific, complement- or noncomplement fixing, as well as donor T (HLA-Class-I) and/or B cell (HLA-Class-I and II) specific. These alloantibodies play a pivotal role in antibody-mediated renal transplantation rejection. Deposition of C4d in peritubular capillaries of a kidney biopsy is a marker of antibody-mediated rejection. The C4d flow-panel reactive antibodies (PRAs) are a screening method for HLA-specific and complement fixing antibodies. However, the method is limited by the lack of donor specificity. Design and Settings: Here, we present a new and simple flow cytometric method referred to as C4d-flow cytometry crossmatch (C4d-FCXM) for the detection of donor-specific (T and/or B cell) and C4d-fixing alloantibodies. Results: The method was applied in a series of clinical cases and judged to be useful. The method may limit unwanted deferral of the donor due to positivity in C4d Flow-PRA and/or FCXM and may be helpful in prediction of antibody mediated rejections. Furthermore, this method can provide information pretransplant in contrast to kidney biopsy and C4d evaluation done posttransplant. 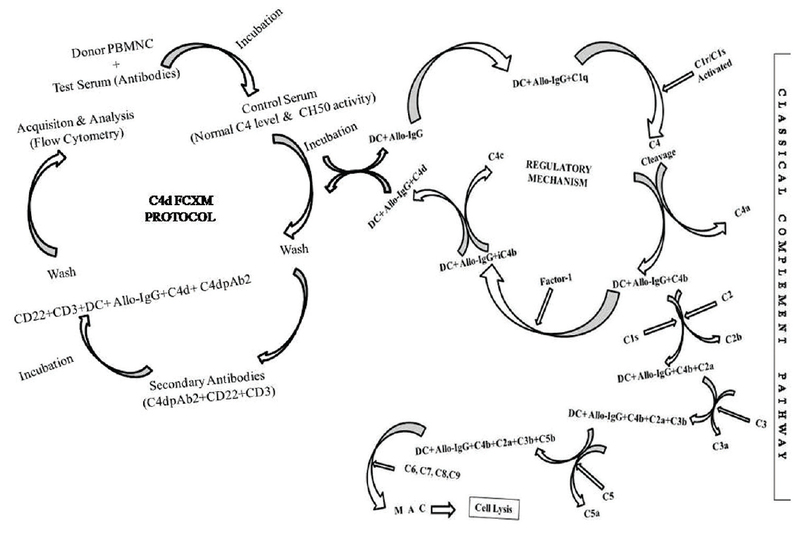 Conclusions: We postulate that this method incorporates most of the features of all the available modalities (i.e., National Institute of Health-complement dependent lymphocytotoxicity, FCXM, cytotoxic FCXM and C4d-flowPRA) yet cost-effective and best suited for resource-limited laboratory/ies which is a common scenario in developing countries. Background: Use of blood and its components is lifesaving. However, their use is often associated with adverse events. Objective: To analyze the pattern of adverse reactions associated with transfusion of blood and its components in pediatric and surgical patients at a tertiary care teaching hospital. Materials and Methods: Patients receiving transfusion of blood or its components in a randomly selected unit each from Departments of Pediatrics, including thalassemia OPD and surgery, were monitored intensively for a period of 6 months. 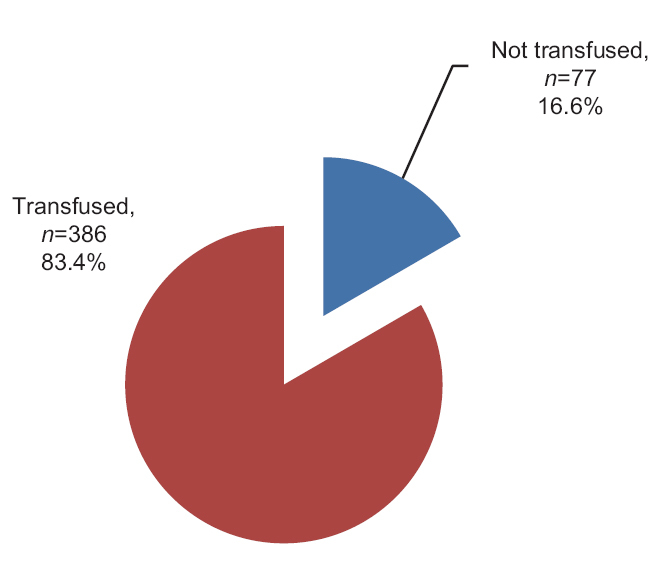 Clinical course, management, outcome, causality, severity, seriousness, and preventability of observed transfusion reactions (TRs) were analyzed. Results: A total of 411 pediatric and 433 surgical patients received 594 and 745 transfusions respectively during the study period. 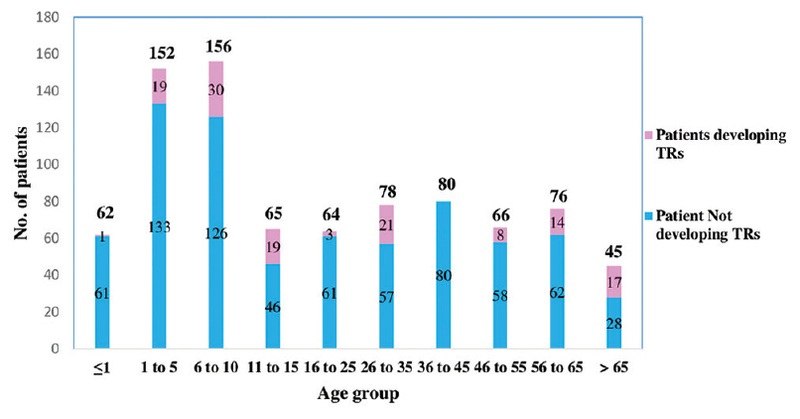 Of these, TRs were observed in 69 (11.6%) children and 63 (8.4%) surgical patients. Majority of reactions in children (48, 69.5%) and surgical patients (51, 80.9%) were acute, developing within 24 h of transfusion. TRs were observed with packed cells (13.2%), cryoprecipitate (10%), platelet concentrate (14.3%) and fresh frozen plasma (1.3%) in pediatric patients and with packed cells (7.2%), whole blood (25%) and platelet concentrate (62.5%) in surgical patients. Most common TRs included febrile nonhemolytic TRs (FNHTRs) and allergic reactions. Reactions were more frequent in patients with a previous history of transfusion or those receiving more than one transfusion and in children, when transfusion was initiated after 30 min of issue of blood component. Majority of reactions were managed with symptomatic treatment, were nonserious, moderately severe, probably preventable and probably associated with the suspect blood component in both populations. Conclusion: Transfusion reactions in children and surgical patients are commonly observed with cellular blood components. Majority of reactions are acute and nonserious. FNHTRs and allergic reactions are the most common transfusion reactions. Risk of transfusion reactions is more in patients receiving multiple transfusions. Background: Prozone phenomenon is seen with very high-titer antibodies in an immune serum. Aim: The prozone effect on anti-D by a low-titer anti-Lea was investigated associated with neonatal jaundice. Materials and Methods: Standard methods were used in investigations. Results: The child was born at full-term developed mild jaundice. With weak direct antiglobulin test+, her indirect serum bilirubin was progressed to 27.5 mg/dL in 48 h. Anti-D and anti-Lea were detected in the mother. Both these antibodies were detected in the child's serum though the eluate from red blood cells (RBCs) contained only anti-D. Mother's anti-D was masked by anti-Lea if the RBCs possessed both the antigens together. Anti-D was revealed only with D-positive RBCs lacking Lea or if the serum was modified by mixing with Lea+ saliva or was heated at 56°C or fortified with citrate solution. Conclusion: An anti-D showed prozone effect exerted by the complement-fixing anti-Lea in the test. 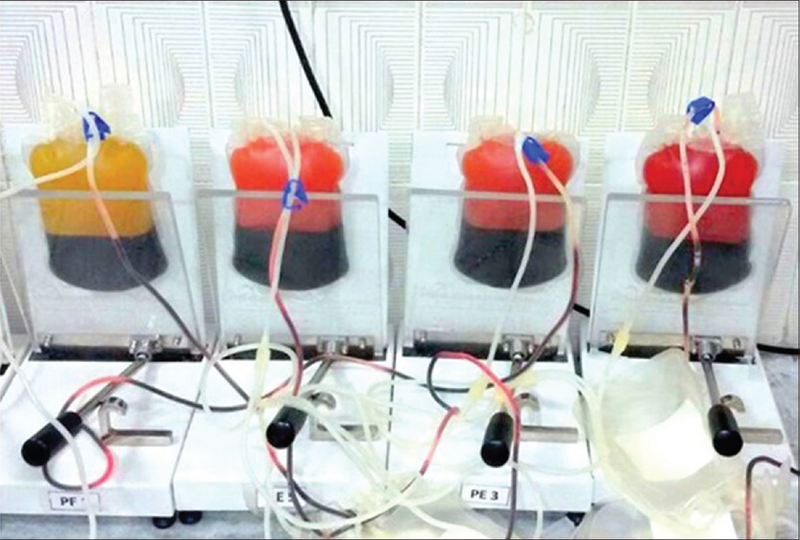 This case marks the beginning of issuing cross-matched platelet products in Eastern India. 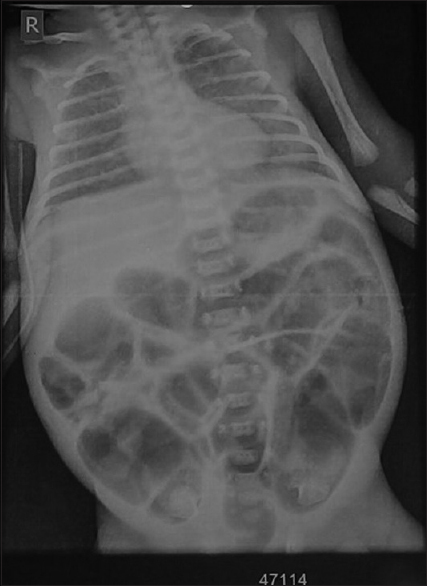 A known case of aplastic anemia, on regular transfusion support, now presented with obstructed ventral periumbilical hernia requiring urgent surgical intervention. Platelet count at presentation was 13,000/μL. Platelet cross-matching was done by solid phase method. Ten units of random donor platelets were crossmatched. Five units were compatible and transfused. Counts rose to 84,000/μL after 1 h. Surgery was completed successfully. Thus, 50% units were compatible. This indicates possible underlying alloimmunization. Rapid count rise enabled completion of this urgent surgery. This rapid rise of platelet count would not have been possible without cross matching. We conclude that platelet cross matching is a powerful tool for alloimmunized patients. Autoimmune hemolytic anemia (AIHA) is featured by short red cell survival due to autoantibodies. AIHA caused by anti 'e' is a tough clinical situation as antigen 'e' is a highly prevalent antigen. The present case highlights the same and different issues related to it. Hemoglobin (Hb) D-Punjab [β 121(GH4) Glu→ln; HBB: C.364G>C] and β0-thalassemia 3.4 kb deletion are very rare in the Thai population. For the first time, the coinheritance of HbD-Punjab with β0-thalassemia 3.4 kb deletion was reported in a 7-year-old Thai girl. She had mild anemia (Hb 115.0 g/L and mean corpuscular hemoglobin 18.1 pg) with red blood cell microcytosis (mean corpuscular volume 52.5 fL). By capillary electrophoresis (CE), HbD-Punjab was found at a migration position of 180 s with the value of 81.9% while the level of HbA2was 7.3%. Based on the elevated HbA2, the molecular analysis for detection of β0-thalassemia mutations was performed. The 490 bp amplified fragments from β0-thalassemia 3.4 kb deletion was observed. Thus, the coinheritance of HbD-Punjab with β0-thalassemia can be found in the Thai population. The HbA2measured on CE is a reliable parameter for differentiating the homozygote of HbD-Punjab and compound heterozygote of HbD-Punjab and β0-thalassemia. Transfusion-related acute lung injury (TRALI) is a potentially life-threatening complication of blood component transfusion. It is relatively underdiagnosed entity in neonates with scant literature. We report a case of TRALI in a preterm neonate developing acute respiratory distress within 6 h of blood product transfusion in the absence of preexisting lung disease. Prompt ventilator and supportive management were instituted. The baby showed clinical and radiological improvement within 12 h; however, he succumbed to death due to acute massive pulmonary hemorrhage 36 h later. Possibility of TRALI should be kept if there is sudden deterioration of lung function after blood transfusion. Intravenous immunoglobulin (IVIG) and therapeutic plasma exchange (TPE) are well-known therapeutic modalities in Guillain–Barré syndrome (GBS). In developing countries like India, where plasma-derived products (IVIG) are not easily available, and affordable TPE is preferred. Here, we reported a case of severe GBS, who was treated with daily plasma exchange (PLEX) rather than recommended alternate day schedule. 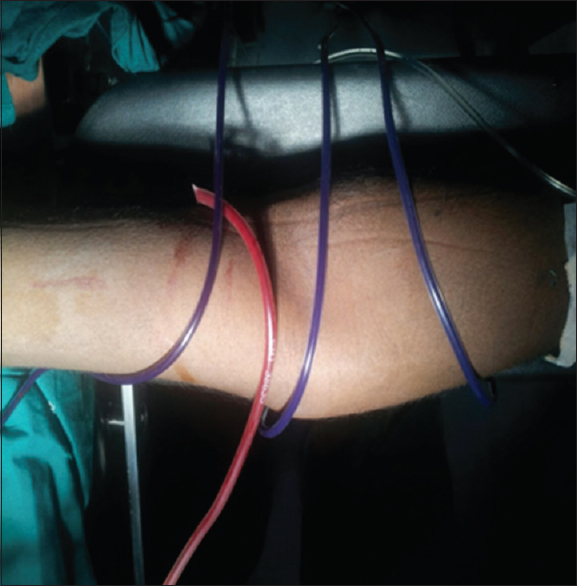 A 16-year-old male adolescent of severe GBS, i.e., on mechanical ventilator was treated with the plasmapheresis regimen consisted of removal of 1.3 plasma volumes in each cycle for total of five cycles, on daily basis. The patient's condition started improving after three cycles of TPE with power in the upper limbs 4/5 and lower limbs 3/5 and completely weaned off from ventilator after the 4th TPE, i.e. the 4th day of admission. This case emphasizes the need of daily PLEX regimen particularly in severe GBS patients because early weaning from ventilator reduces the ventilator-associated complications, hospital stay as wells as less morbidity, and mortality in severe GBS. Daratumumab is a monoclonal immunoglobulin against CD38 and has been approved for treating patients with refractory multiple myeloma. The presence of daratumumab in the sera can interfere with pretransfusion testing due to the weakly expression of CD38 on red cells. The reactivity could be mistaken as autoantibody (if autocontrol is positive) or alloantibody (if autocontrol is negative). We present a case that demonstrates daratumumab could mimic a high titer low avidity (HTLA) alloantibody. A 34-year-old male patient of refractory myeloma was recruited in phase three clinical trial involving daratumumab. Samples were sent to the blood bank for pretransfusion testing. Without knowledge of patient having used daratumumab, we mistook the reactivity in the patient's sera as an HTLA antibody due to the results of negative autocontrol and high titers of antibody activity. Antibody screen showed a panreactive pattern and the reactivity against screening cells was up to a titer of 1: 1240. The reactivity was weaker against cord cells than adult cells, became weaker against ZZAP-treated cells and became negative against DDT-treated cells. A discussion with attending physician finally revealed the reactivity was due to the interference caused by daratumumab. The case demonstrates good communication is essential in performing pretransfusion testing for patients receiving daratumumab and other new biological regimens that can interfere with compatibility test.